Happy New Year!! I want to wish everyone a very happy new year, and I hope it will be filled with fun and joy and many creative projects. As always at the end of a year, I go through my posts and pick some favorites. It is kind of a random process, because I am not good at picking favourites, and to narrow it down, I will pick one project from each month (and two from a few). From January, I picked this Old Nonsense art journal page. It is happy and hopeful and fits perfectly at the start of a new year. 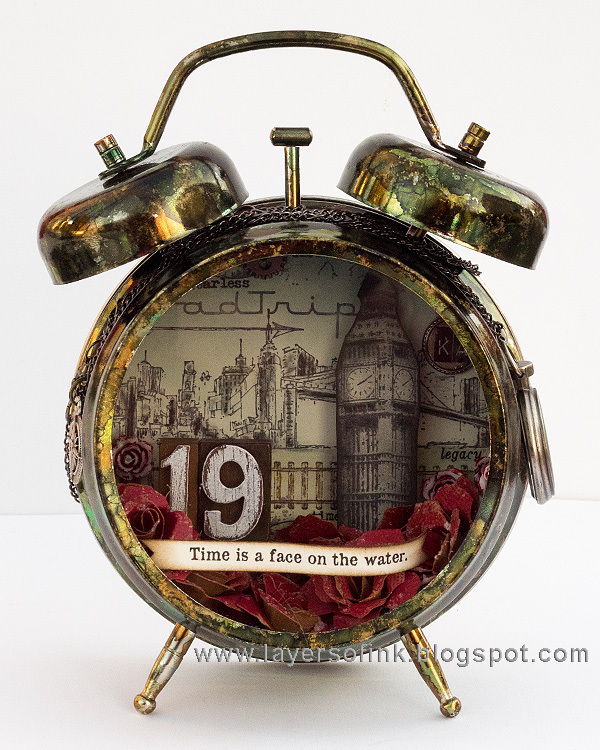 From February, I picked my Dark Tower Assemblage Clock, inspired by the Dark Tower book series by Stephen King. I had such fun adding all kinds of details relating to the story. 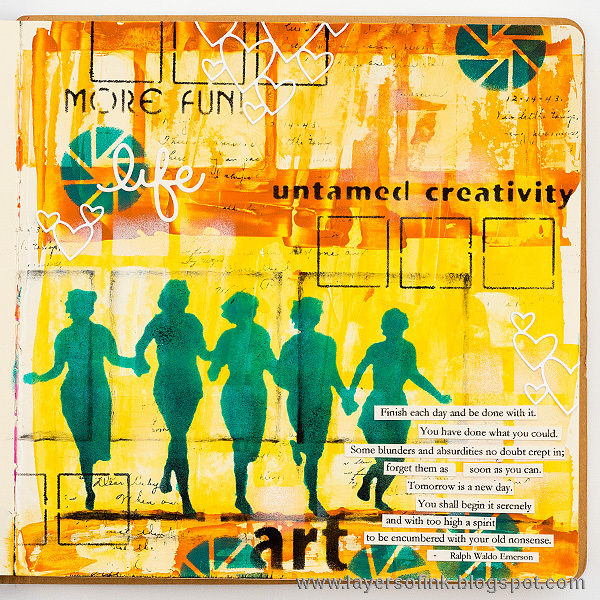 I picked two projects from March, since I really wanted to include this colorful art journal page in a post on New Year's Eve. It has such a positive theme. I haven't picked my one little word for 2018 yet, but maybe it should be one of these. 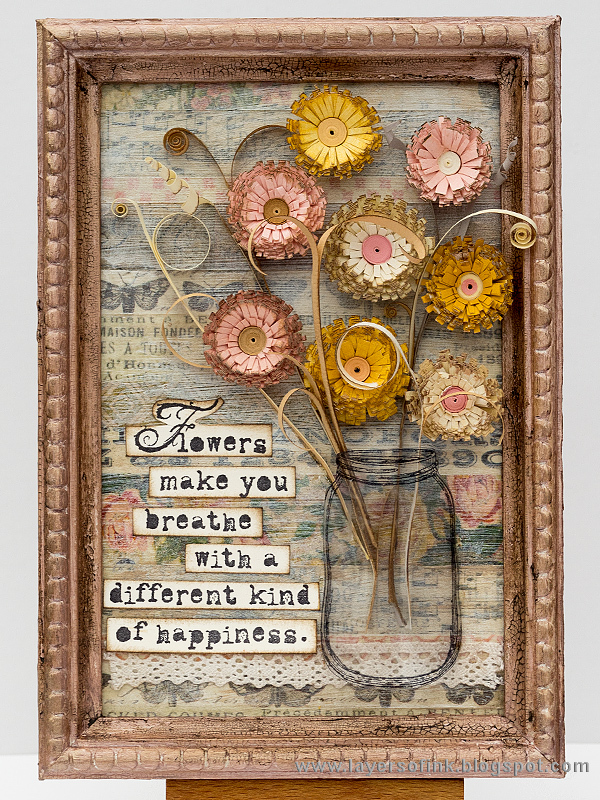 From March, I also picked this Quilled Flowers in a Frame, since I really like the look of fringed flowers, and because of the lovely sentiment by Wendy Vecchi. 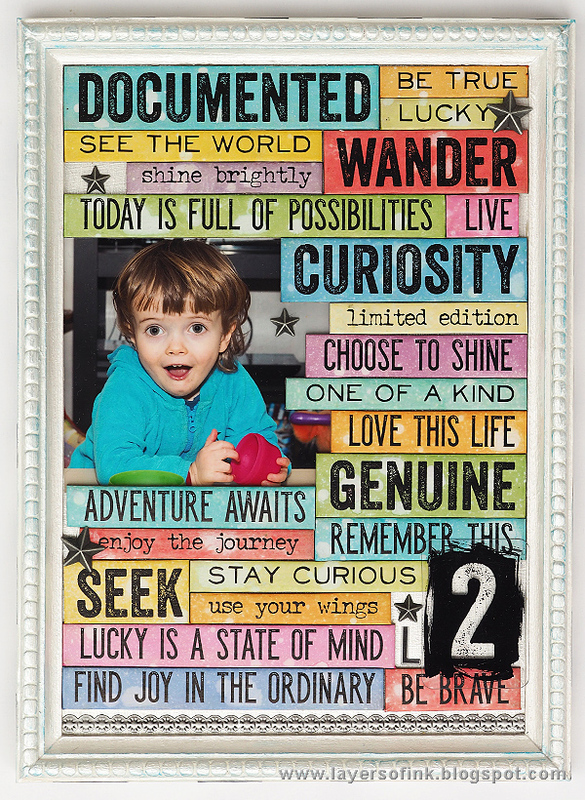 From April, I picked my Bright Words in a Frame project, because of all the colorful words, and the cute photo of Leo. 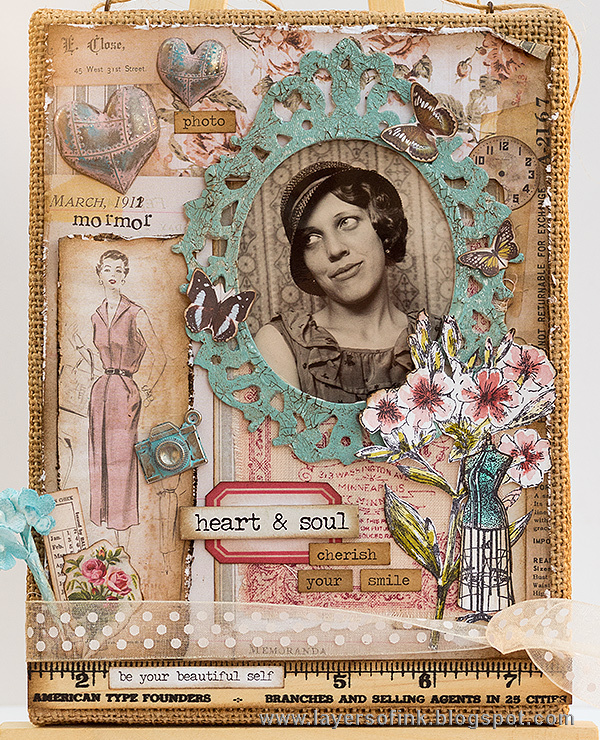 I wasn't sure what to pick from the month of May, but I really like this burlap panel with a photo of my grandmother when she was young. It now hangs on the wall in front of my desk. 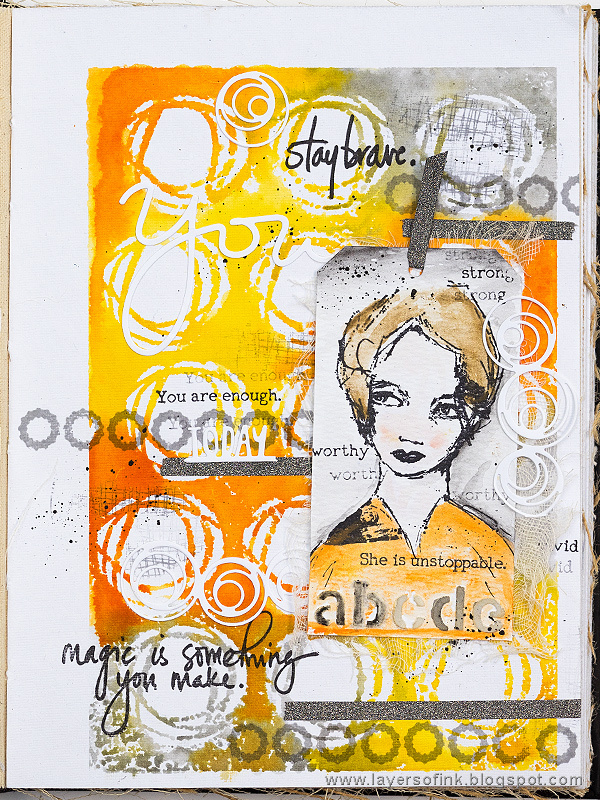 One of my favorite surfaces to work on this year, has been Dina Wakley's Media Journal, and this Stay Brave art journaling page was made on one of the watercolor pages in the journal. It's my pick for June, also since I really like the colors. 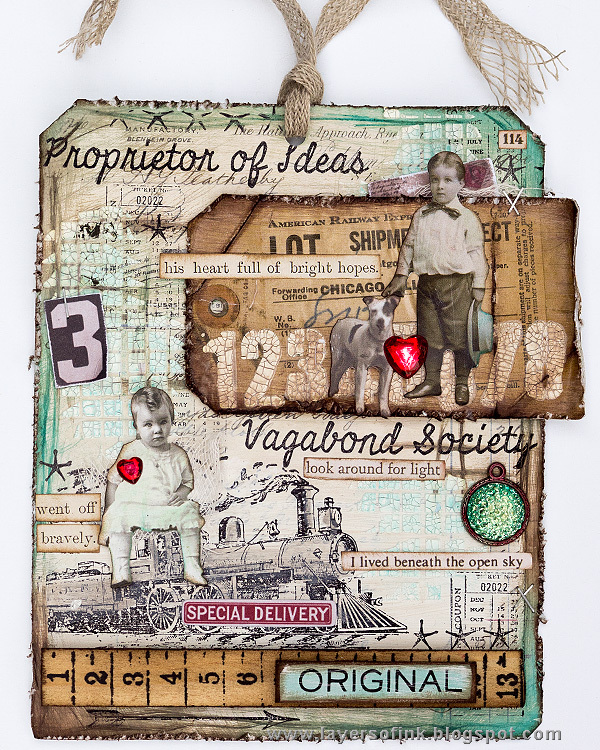 From July, I picked my Distressed Texture Tag, simply because I had such fun using lots of distress techniques andd adding words and details. This Woodgrain Chalkboard Easel also comes from July, and I like it because of the photo of the three of us from a visit to South Africa. Anton has it in his room, and on the back there is a photo of him on his own. 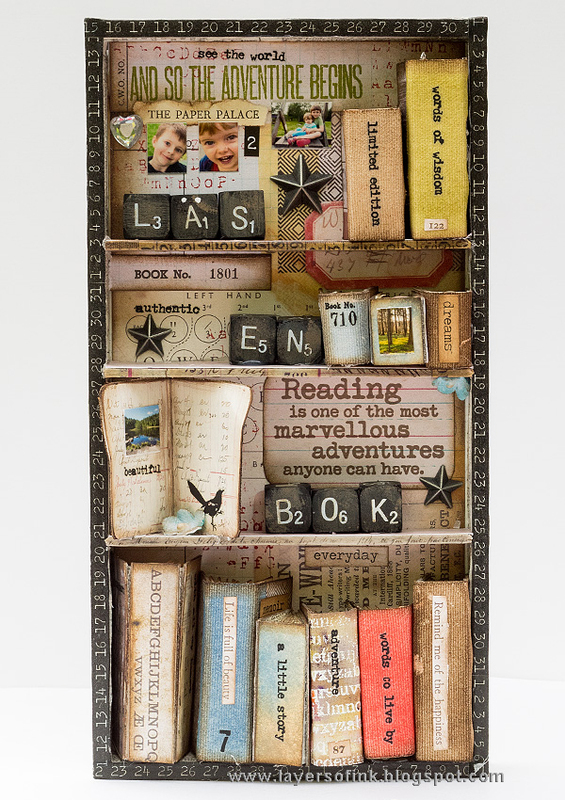 August was a fairly easy pick, since this Miniature Bookshelf with Handmade Books is something I had planned to do for a long time. I had such fun making all the books and picking tiny photos to go with them. 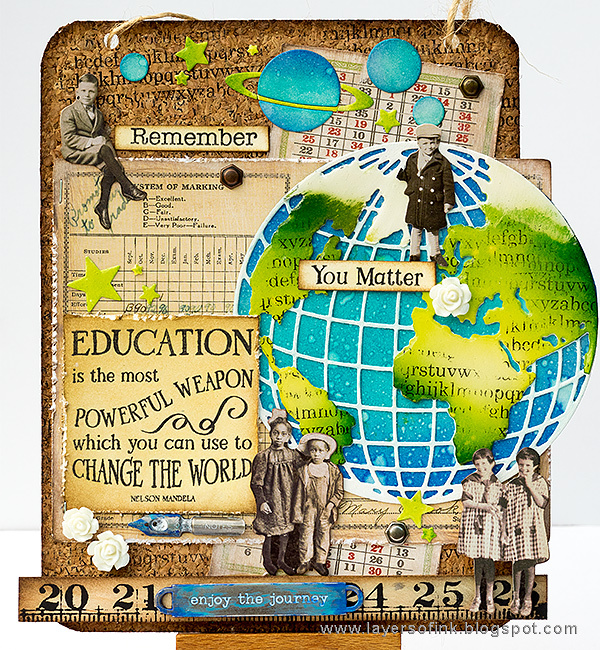 I still had to pick a second project for August, namely this You Matter wall-hanger, with an education theme. 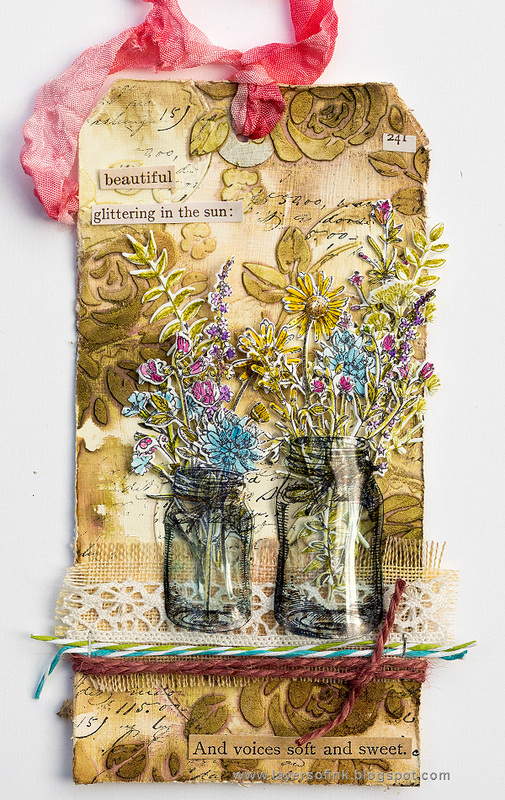 From September, I picked this Wildflowers in a Mason Jar tag. I like the way the textured background turned out and that it is neutral enough not to take too much attention from the small flowers. October was another difficult month to pick from, but I really like this Autumn Days layout featuring Leo, made witth dies and embossing folders by Eileen Hull. 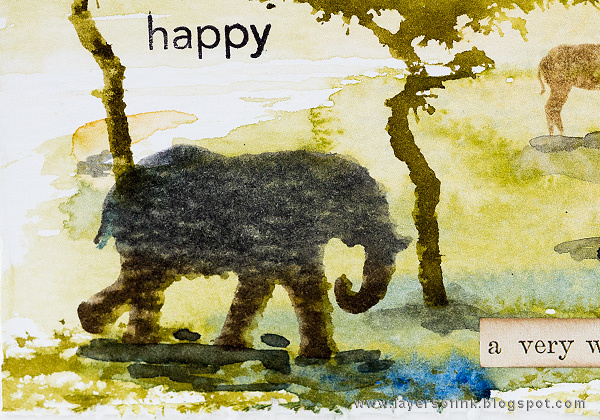 Other favorite projects from October were my Alphabet Notebook and Sketchbook Journal, but since I posted them in an Eileen Hull recap post a couple of days ago, I didn't add them here. 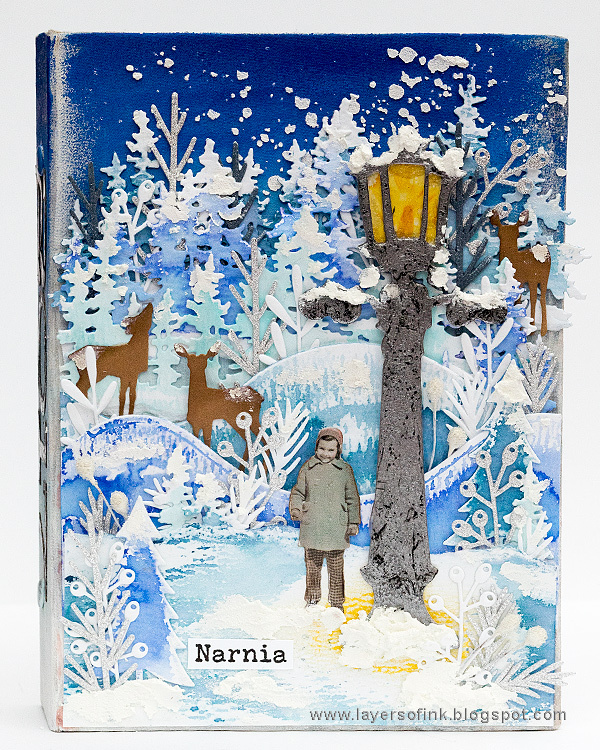 From November, I picked my Narnia-inspired December Daily journal, not only because it is one of my favourite projects of the year, but also because it started a Chronicles of Narnia reading marathon where I have been reading for Anton. He reads a bit here and there too. I picked two projects from December. 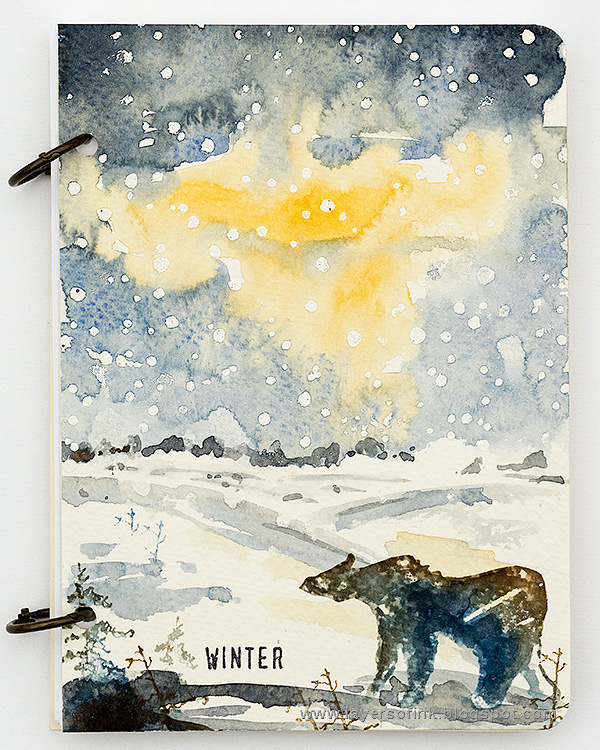 I really enjoyed making these Winter Watercolor Notebooks. 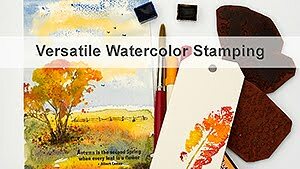 The combination of watercolors and stamping holds so much potential. I ended up making ten of these little books. And let's finish this post with a fun little Penguin card. 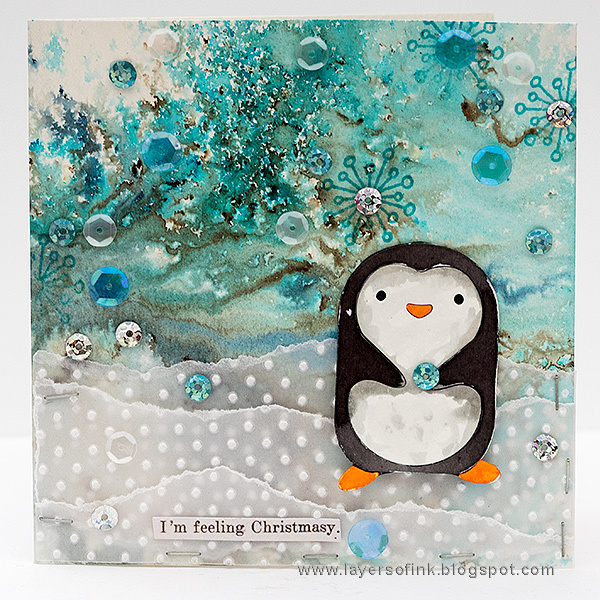 I love the sweet SSS Picture Book Hugging Penguin and the icy background. There is just about ten hours left of 2017 as I am typing this. Thank you so much for all your comments and support through this year. 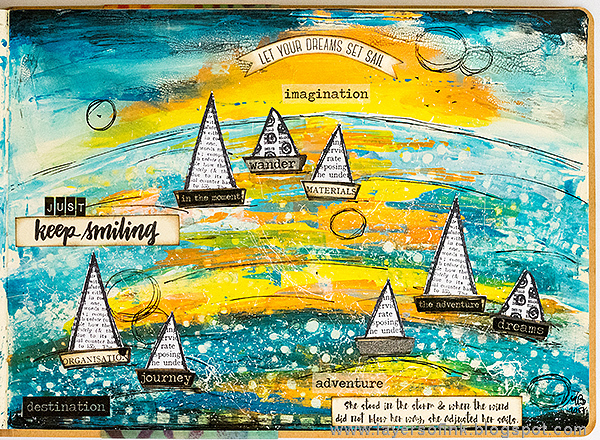 I am looking forward to a new year full of adventures, everyday life, happiness and creative projects. Hi all! I hope you had a really wonderful Christmas. We have had a lovely time together with family and the boys have loved it. A fun surprise for them was an unknown Santa who came on Christmas Eve to hand out gifts. Anton was pretty sure it was going to be his uncle and got a big surprise when it appeared to be a real Santa instead. I have been offline during Christmas, but today I wanted to share a post for the Eileen Hull Inspiration Team. 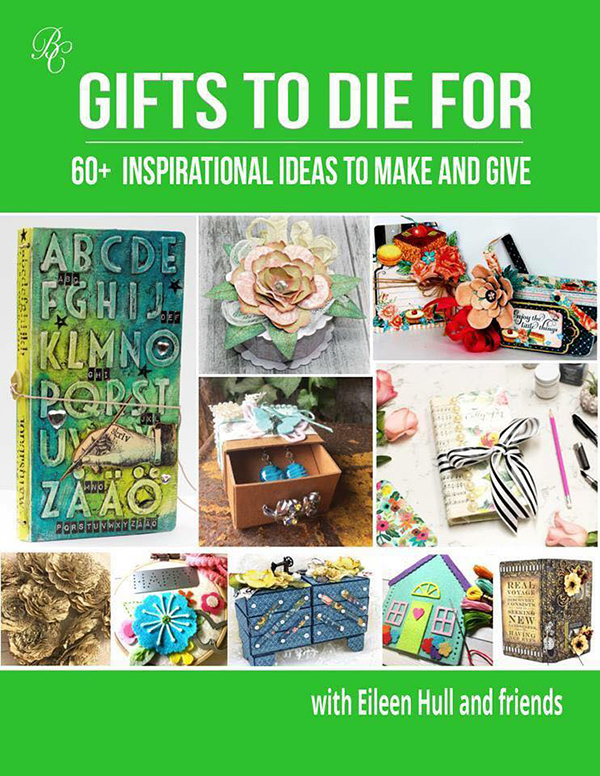 This month, the team has been sharing projects that are published in Eileen's new Gifts to Die For e-Book, by Bella Crafts Publishing. 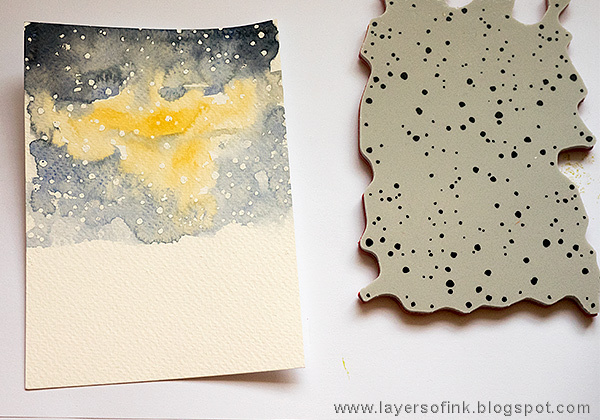 My projects have been up on the blog before, so I thought I'd do a little recap post instead. 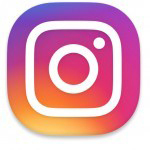 These are all tutorials, and you'll find the links below the photos. 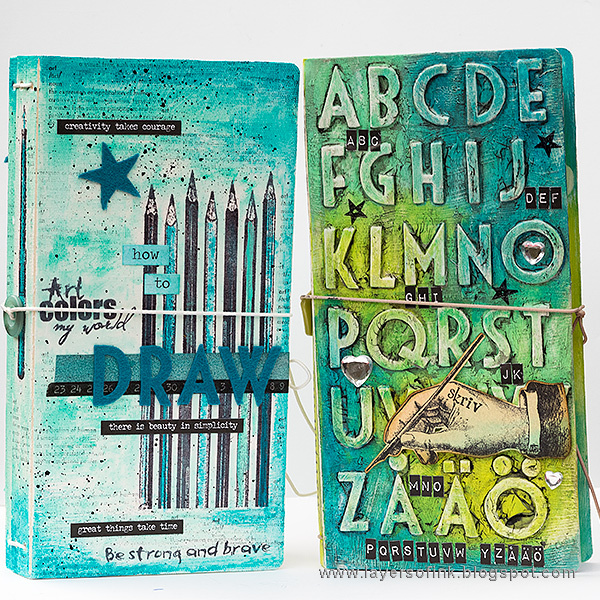 Both my Sketchbook Journal and Alphabet Notebook Journal were made for Anton to practice drawing and writing in. They helped to make it even more fun for him to practice. 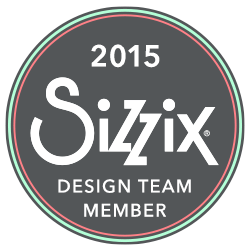 The base for both is Eileen's Sizzix Journal die. 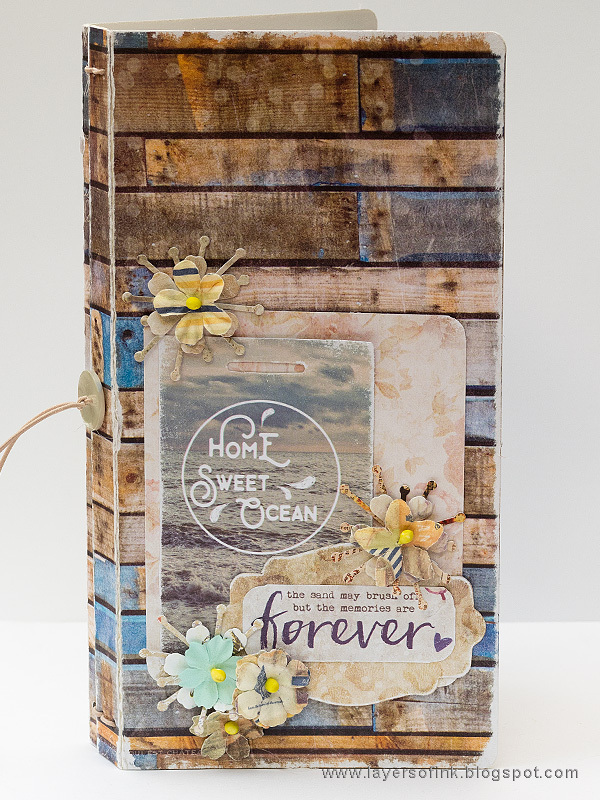 The Seaside Journal was made with that same die and holds summer memories. 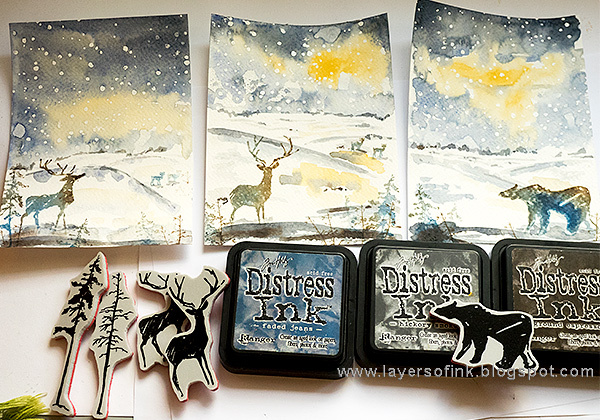 I am looking forward to doing more projects with the Journal die next year. One of my other projects in the e-Book is this Fidget Spinner bag, made for what was maybe the biggest craze of the year. The base is Eileen's House Pocket die and the fidget spinners were made with one of the flowers in the Stitchy Flowers & Leaf set. Both are from the Heartfelt collection. 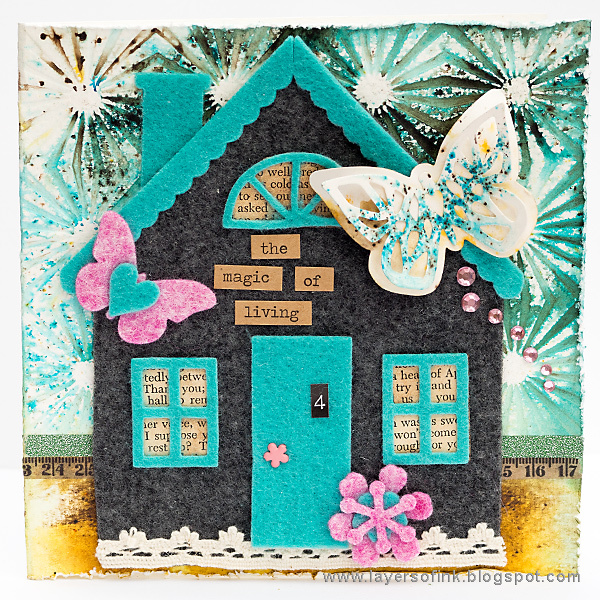 Dies are so versatile, and this Felt House card was made with the same House Pocket die that was used for the Fidget Spinner die, as well as the Birds & Butterflies and Stitchy Flowers & Leaf sets. As I am typing this up, I realize that the Stitchy Flowers & Leaf was one of my most used die sets this year, and here you see it again, on a Flower Basket, made with the Basket die as a base. 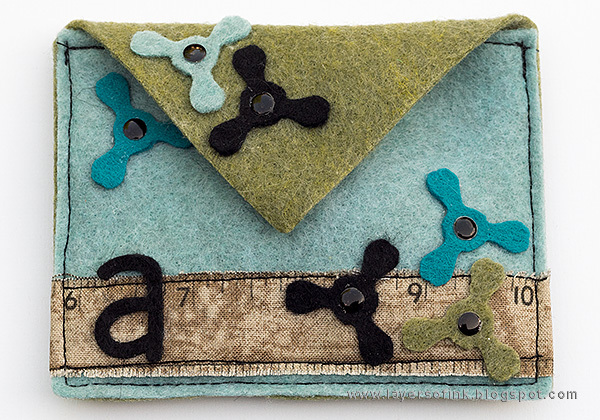 There are over 60 gift projects in Gifts to Die For created by designers from around the world. For each project, there is a link to a tutorial. 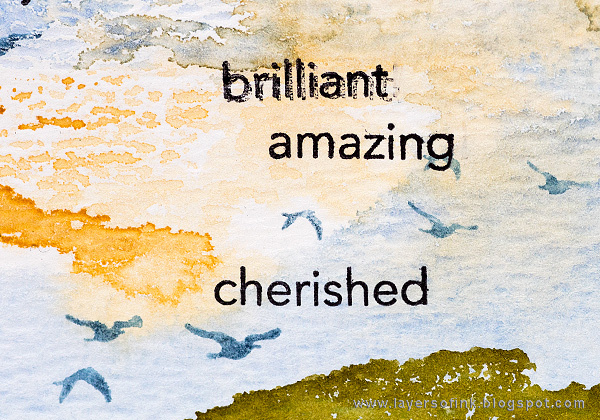 The book is a great source of inspiration for using Eileen's Sizzix dies, and it is also a joy for the eye to look through. 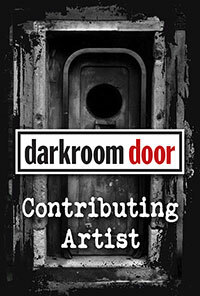 I will be back again before the new year, with my a post about my favourite projects throughout this year. Two of them happened to be in this book, namely the Sketchbook and Alphabet Journals. Thank you so much for stopping by today! Happy crafting! Hello everyone! I just wanted to share one last project before Christmas, and wish everyone a very Merry Christmas! The boys can't wait for Christmas Eve (which is the main day of family celebrations here). 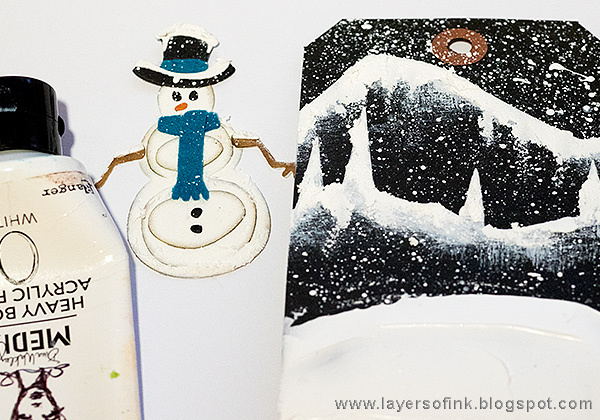 Here's a Sizzix tutorial for a very snowy tag, with some fun techniques. 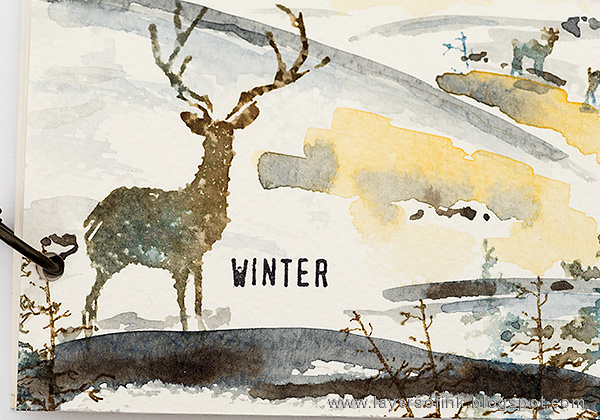 The good thing with winter type themes is that they aren't only for Christmas, but work well for the entire winter. 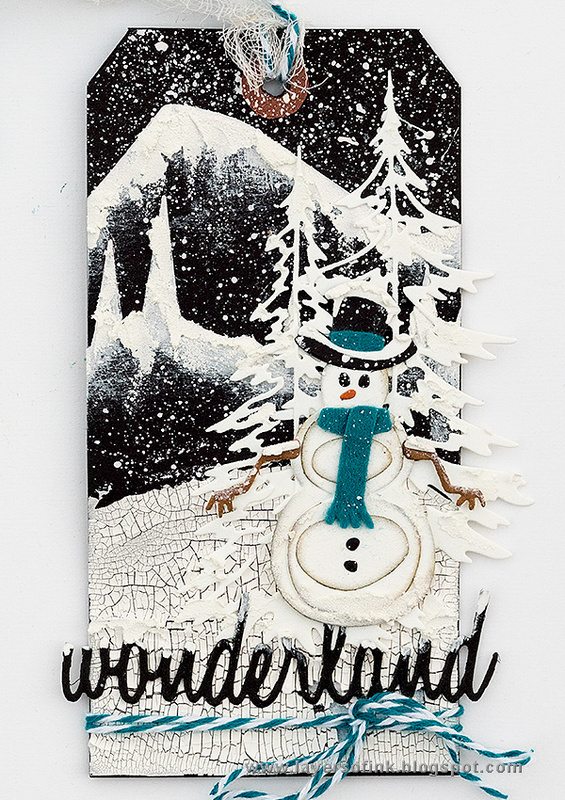 When I was looking at the packaging of the Tim Holtz Snowman Scene set, I wanted to play around with using some black cardstock for my background. Black cardstock is something that I don't use a lot, except for as mattes, but I rarely do techniques on top of a black surfaces. I really should reach for black cardstock more often. 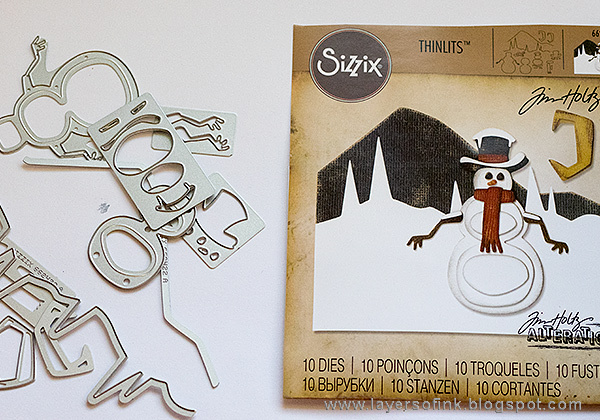 This is the Snowman Scene set that I used for my tag. 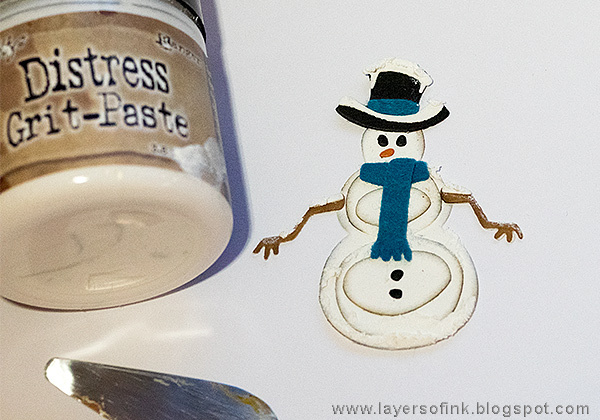 I love the look of the layered snowman and the background elements will work well for projects throughout the year. 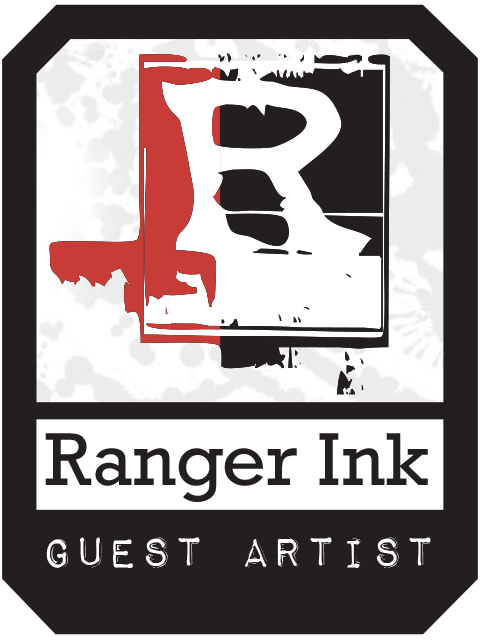 I used two black tags from Ranger, one as a base and the other one was die cut into two pieces, using both background dies. 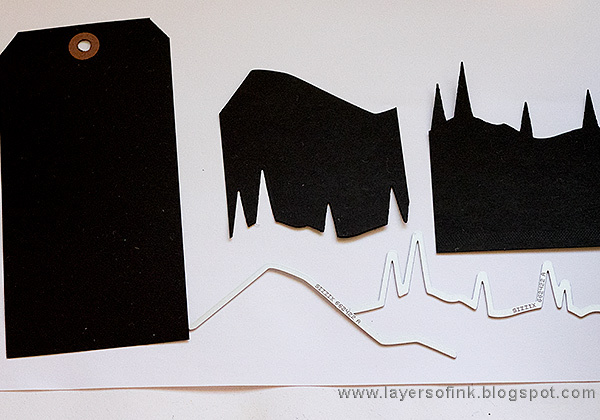 You can also die cut tags from black cardstock. Paint white at the top, as snow. 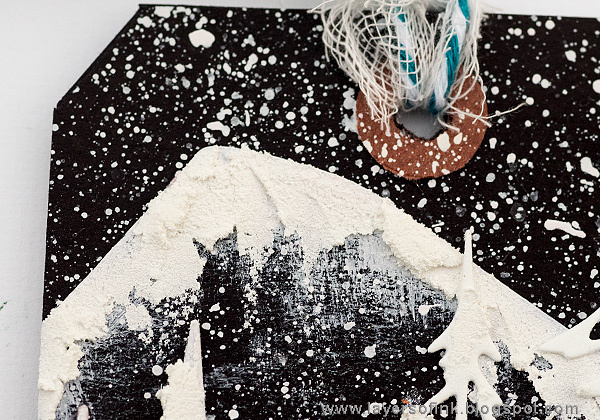 Add even more dimensional snow with Grit-Paste, but don't cover up all the white paint. 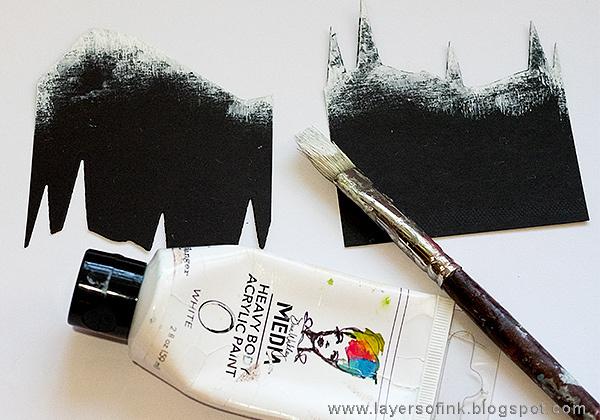 Glue the two pieces to the background as shown and smear Opaque Crackle Paste on the lower part of the tag. As it dries, cracks will appear, and the paper might roll up a bit since the paste shrinks slightly as the cracks appear. 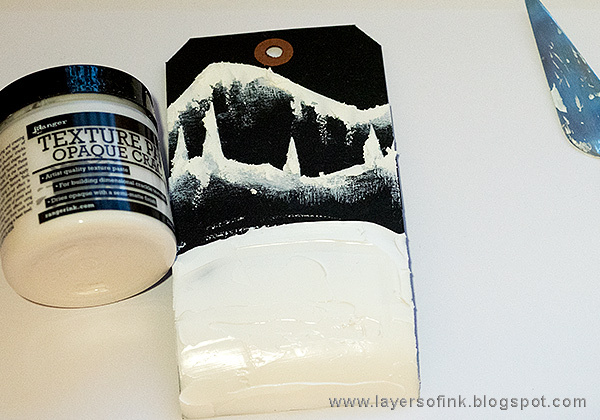 I glued my entire tag to another tag with matte medium, when the crackle paste was dry. 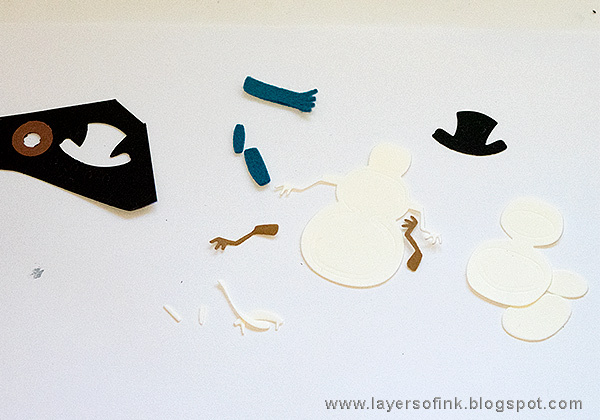 Die cut the pieces for the snowman. I used Sizzix Paper Leather for everything, apart from the hat, which was die cut with a left-over piece of black tag, and the scarf, which is die cut from wool felt. Paper Leather is perfect for detailed die cuts and is very tough and really hard to tear, even if you try. 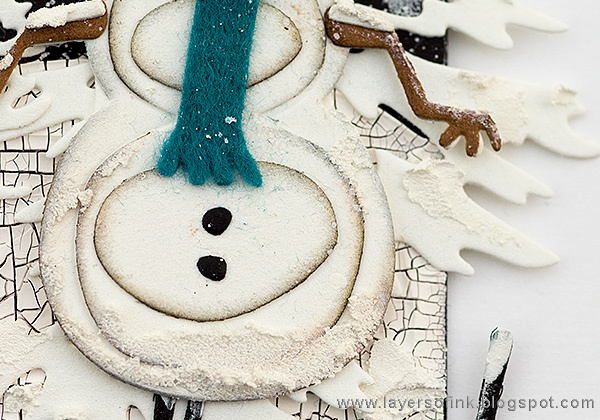 Ink the edges of the snowman's body, to create depth. 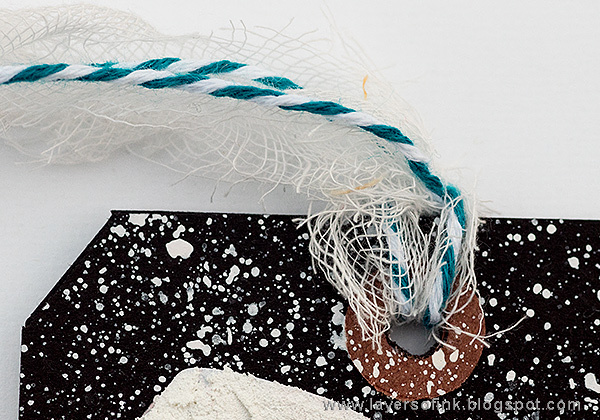 Glue together and smear a little Grit-Paste here and there. 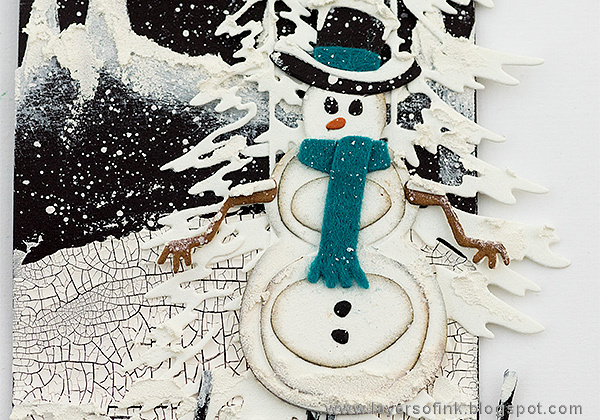 For that really snowy look, splatter white paint with a splatter brush all over the background and a bit on the snowman too. 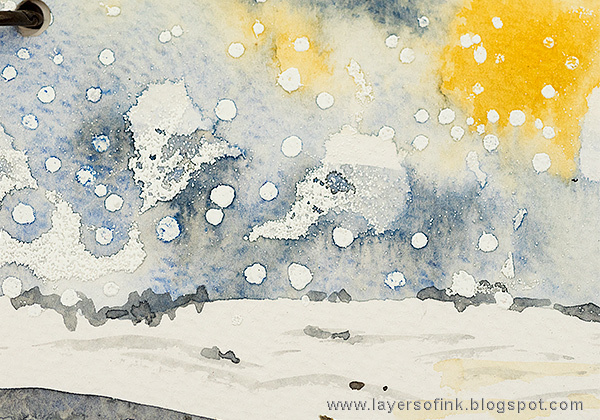 Here you see the effect of the three types of snow: white paint, Grit-Paste, and splatters. I tied the tag with a piece of twine from a gift I got and a little cheese cloth. Isn't the snowman fun? I love how the different snowman dies and stamps I have look so different, each one has it's own look and personality. 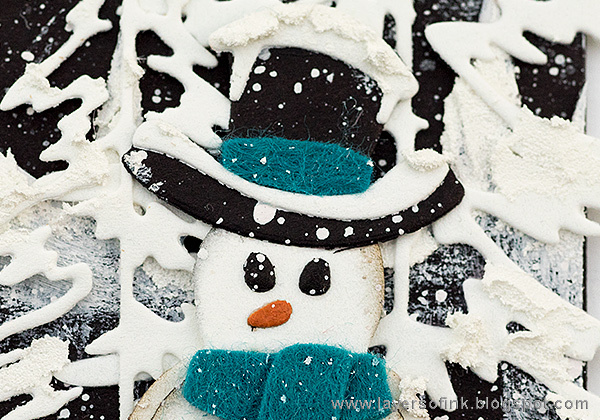 Now, we only need some proper snow so that we can make a real one too. I thought it was a little empty behind my snowman, so I die cut two Woodlands trees from Paper Leather and glued them down. 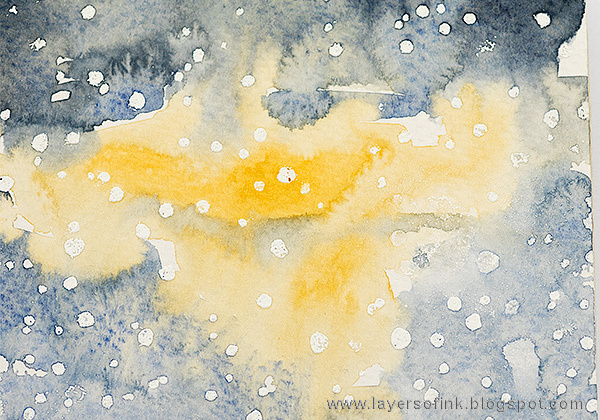 The splatters makes him look even more a part of the snowy landscape. Here you see the effect of the inking and Grit-Paste better. It will also look great with foam dots in between those circles. 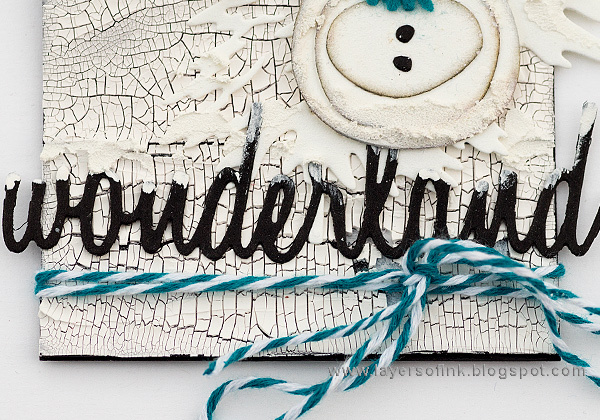 Die cut a sentiment from black Paper Leather and tie a ribbon as a border. Some pieces of crackle texture might fall off, you can add a layer of glossy medium on top if you want to secure it better. I will be back again before the New Year, but I still want to thank you now for visiting my blog through the year and for all the lovely comments. I really enjoy reading them. I hope you will have a wonderful Christmas and that you will be able to relax and maybe get a little bit of crafty time. 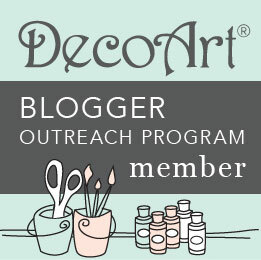 Hi and welcome to my blog today! The world is white outside my window, and although the snow is not very deep, it makes everything lighter. I particularly like when the branches of the trees are covered in snow. 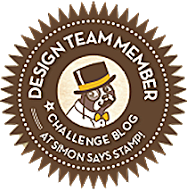 This week at the Simon Says Stamp Monday Challenge blog we have a Christmas / Winter Holiday theme. 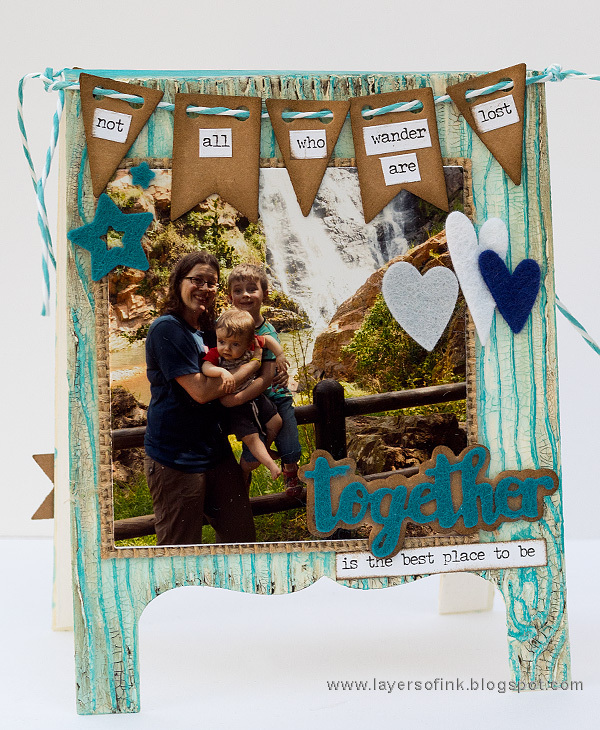 And don't miss checking out the project of our December guest designer Valarie-Jael, with her blog Bastelmania. I started out planning to make cards, but then thought about notebooks, since I needed some small gifts for Christmas. 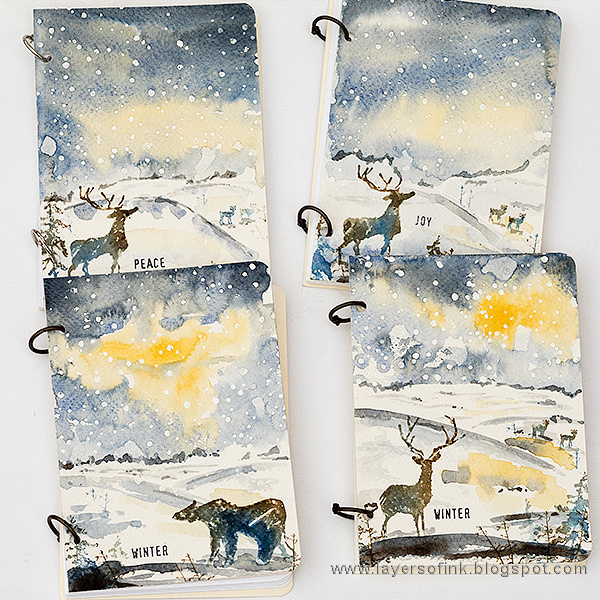 Once I started, I had such fun making these winter watercolor notebooks, that I made four of them. There is some stamping involved too, of course. The notebooks are 4.3 x 6 in (11 x 15 cm) big, which is a good size for a notebook. I used good quality paper inside, so the books can also be used as sketchbooks. 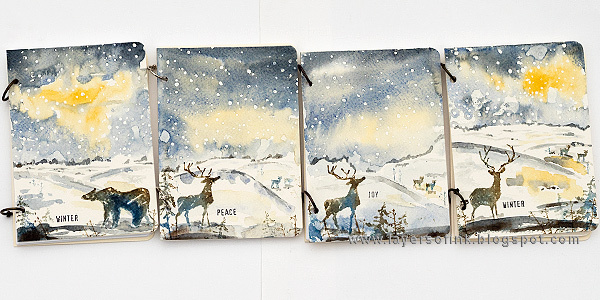 The Great Outdoors set by Tim Holtz is perfect for a winter scene. These are the four notebooks that I made. When I was done, both Anton and I wanted one of our own too, so I might need to make another two. 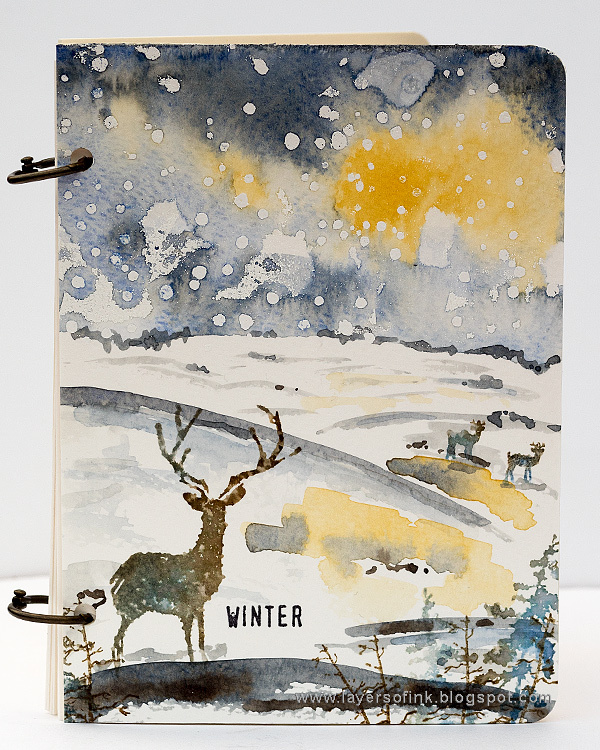 Start out by white embossing Tim Holtz Flurry background on the top part of the watercolor paper. On some of the books, I stamped it about two thirds down on others more to the middle. 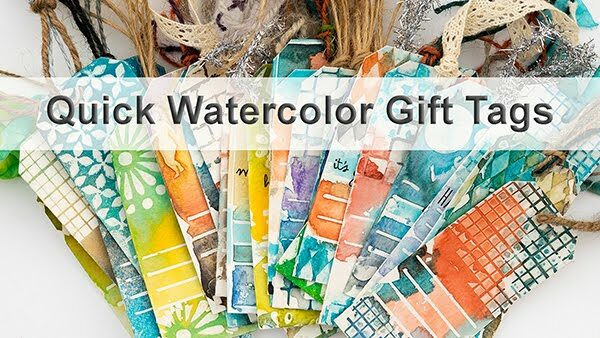 Paint with watercolor paint. 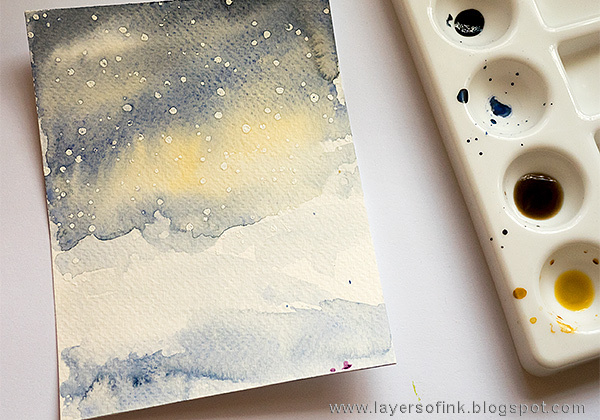 I used a dark greyish blue and a slightly more blue mix for the sky, both made by mixing Ultramarine Blue with Burnt Sienna. The yellow is Raw Sienna. 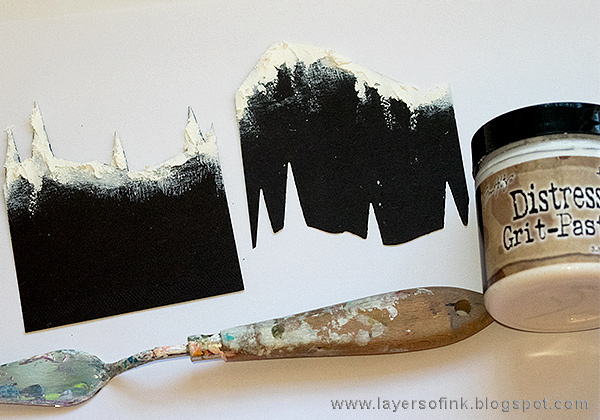 You can also use Distress Ink, by first smearing them on a non-stick craft sheet and then misting with water. A mix of Faded Jeans, Hickory Smoke, and Fossilized Amber, might give a similar look. Paint soft snowy hills next (the other examples might be better than the one on this photo). 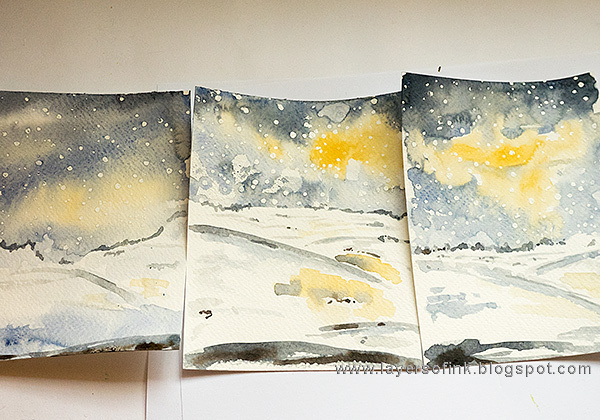 Add some shading to the snowy hills, and don't forget to add a little bit of yellow too, which warms up the scene. Make the scenes darker at the front, to add a sense of perspective. I also painted some trees in the far distance. Now to the stamping. The animals from Tim Holtz Great Outdoors set were inked up first with Faded Jeans, and then I dabbed on a little Hickory Smoke and a little Ground Espresso. 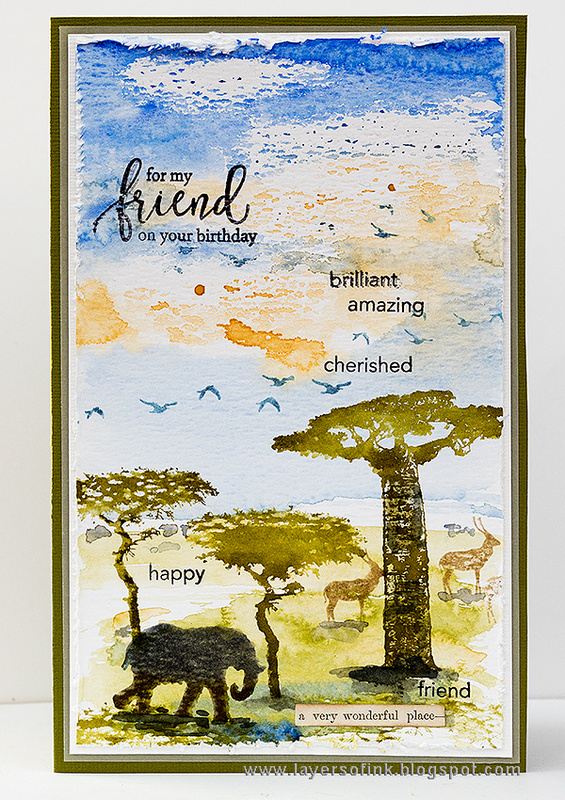 Mist about three times with water before stamping. 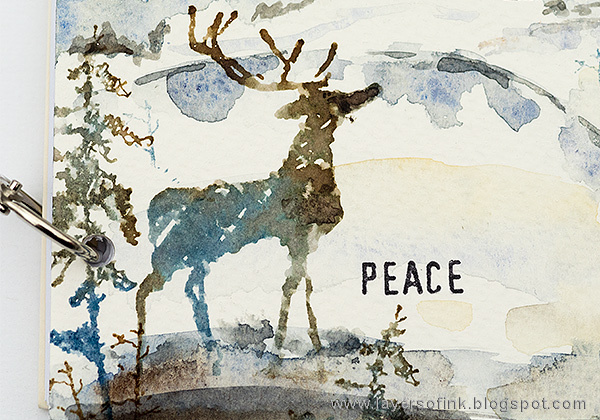 Repeat with the tiny deer from Hero Arts Winter Silhouettes set, but using only one mist of water. I also added some trees from the Great Outdoors set. Paint shadows under the animals to ground them to the scene. I cut mat board for my covers and glued the watercolor panel to the mat board with Matte Medium. The outer corners were rounded for a finished look. 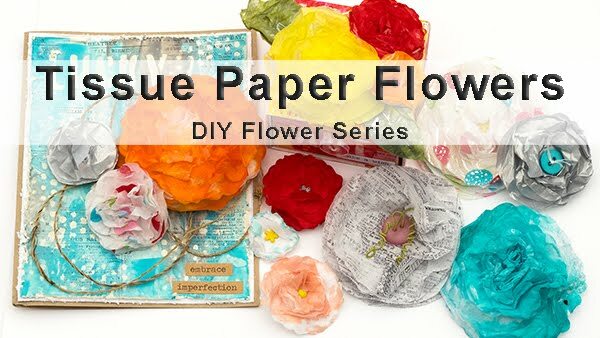 Use your favourite papers for the inside and cut them just a little bit smaller than the covers. 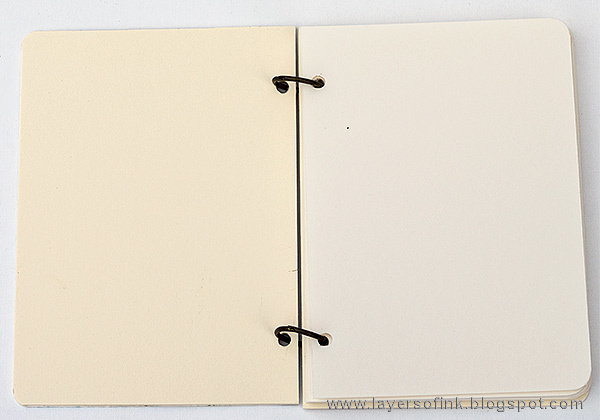 Punch holes with a Crop-a-Dile and bind with rings. I varied the amount of water in the paint on the different notebooks, which is why the colors are darker on some of them. The darker the colors, the more dramatic the sky. I am not sure which of the notebooks I like the best, but it might be this one, and the reason has to do with a mistake that turned out pretty cool. This was the last paper that I stamped when doing the white embossing and I pressed too hard on the stamp and got embossing ink in places were it wasn't supposed to be. I removed some of it with a paint brush, but not all of it, and here you can see the cool resist effect of those unplanned areas. They look kind of like clouds, or maybe snowy mountains in the far distance. 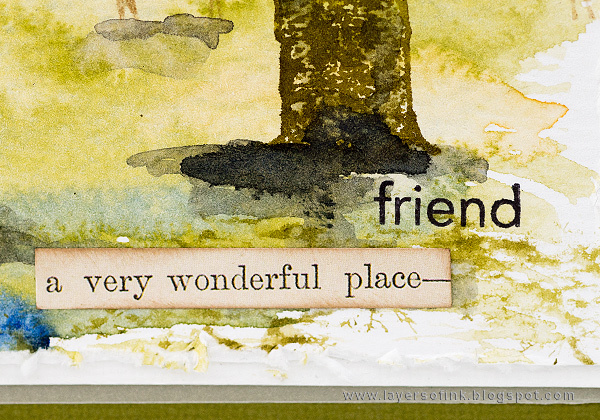 I love watercolor stamping, because the result is never exactly the same. 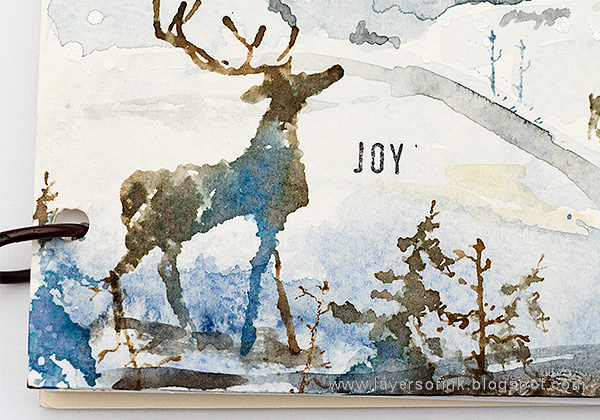 Use a piece of scrap paper to mask of the hill in the front, so that it looks like the deer is standing behind the hill. The bear book also has a dramatic sky. 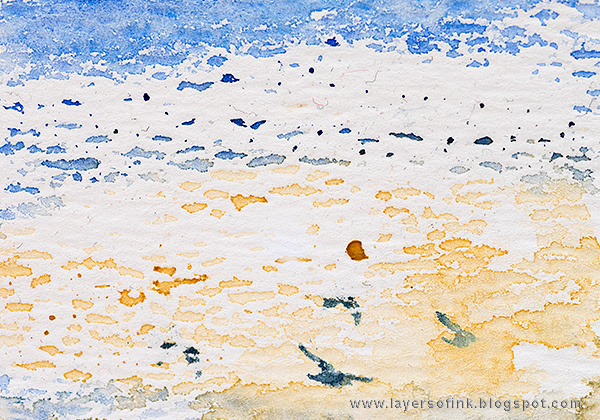 Don't fiddle around with the watercolour paint, instead let the paints blend on their own on the paper and magic happens. 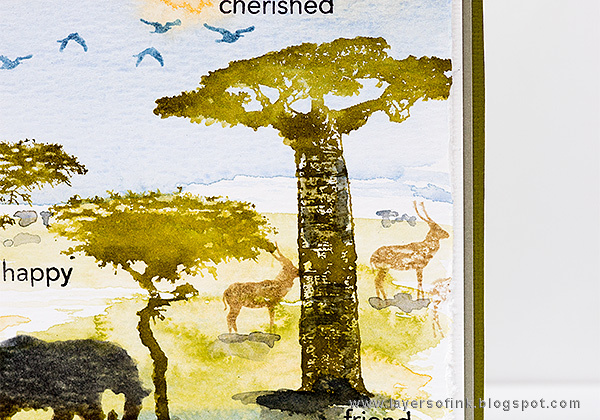 If you are not happy with the stamped impression, you can always go in and add some watercolor paint here and there. 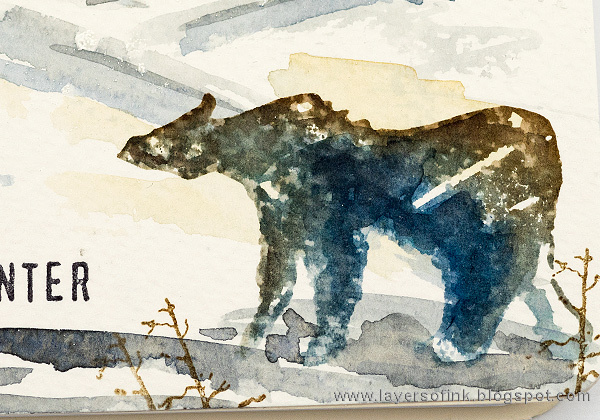 I thought the bear needed a bit of the same blue as the sky, since the Faded Jeans wasn't a complete match, so I simply painted some on. 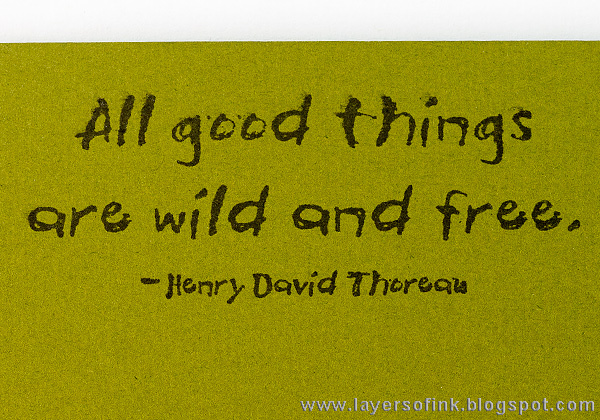 The sentiments also come from the Great Outdoors set. 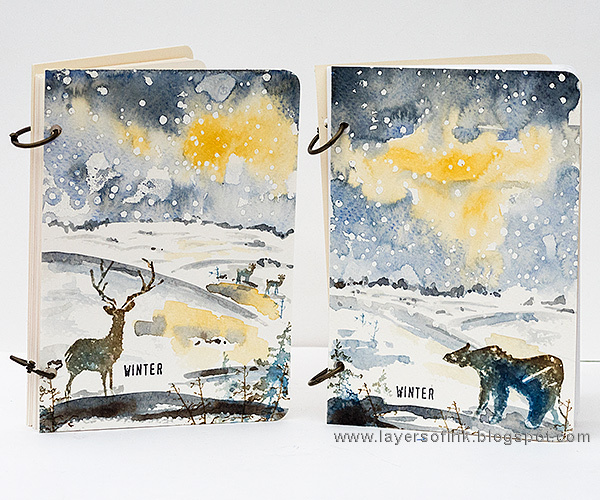 I only used one word from the sentiments, to make the notebooks into winter notebooks and not Christmas ones. This sentiment said 'winter wishes'. Here's another look at the snowy sky. 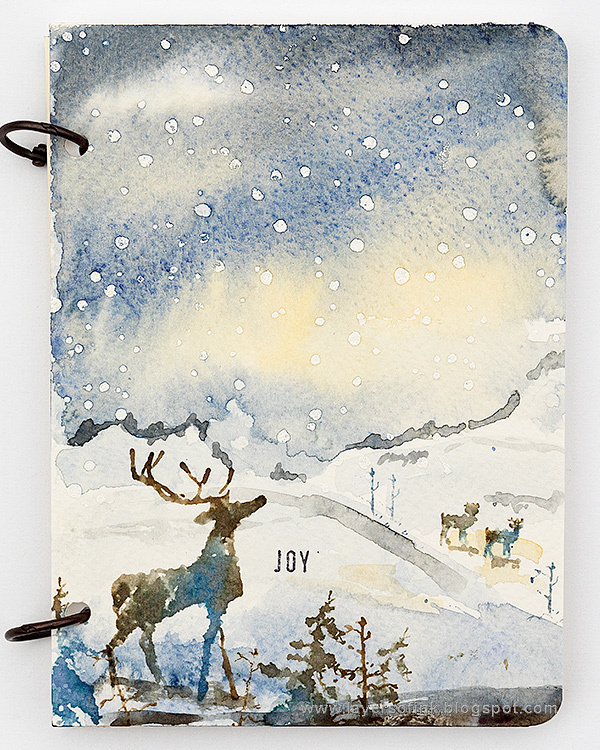 Here's another of the deer books, with a background of soft snowy hills. 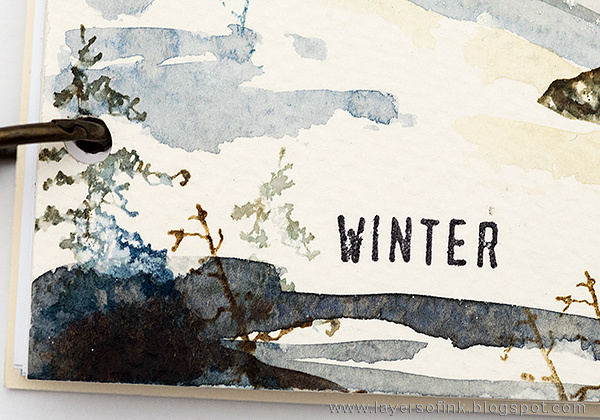 The blue, brown and grey mixes in a nice way on the stamp. 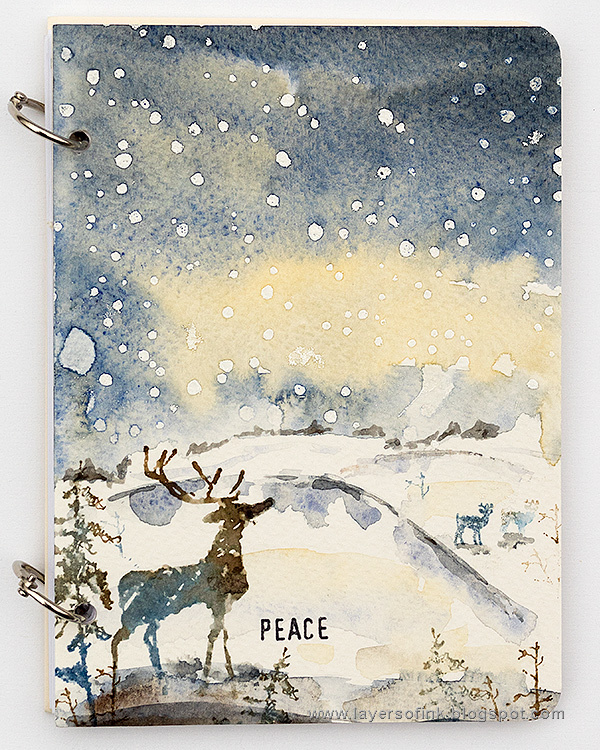 And here is the last deer book, also with a soft looking sky. You could add more stamped trees if you want too, or even make them the main feature. All lined up, the notebooks almost looks like they are part of a continues scene, which wasn't intended at all, but something I discovered when I took these photos. I hope you will join us this week in our Christmas / Winter Holidays challenge. As always, you have a chance to win a $50 gift voucher to do some fun shopping at Simon Says Stamp. You have until Monday 8am Ohio time. 1pm UK time, 2 pm CET to join in.